Causing of hurt to another person is an offence under Pakistan Penal Code. Pakistan Penal Code has described different kinds of hurt. Among these kinds, isqat-i-Haml and isqat-i-janin are those hurts, which are caused during pregnancy. When a person causes woman to miscarry especially in a situation where such woman is pregnant with child and organs of the child have not been formed and such miscarriage is not caused in good faith for purpose of saving life of the woman or providing necessary treatment to her, he/she causes isqat-i-haml. Isqat-i-Haml can be caused not only by another person, but can also be caused by woman to herself. When isqat-i-haml is caused with consent of woman, punishment for such isqat-i-haml is imprisonment, which can extend to three years. When isqat-i-Haml through consent of woman results into causing hurt to woman to death of woman, convict is also liable to that punishment, which has been provided for such hurt or death. When isqat-i-haml is caused without consent of woman, punishment for such isqat-i-haml is imprisonment, which can extend to ten years. When isqat-i-haml without consent of woman results into causing hurt to woman or death of woman, convict is also liable to that punishment, which has been provided for such hurt or death. When a person causes a woman to miscarry especially in a situation where such woman is pregnant with child and some of limbs or organs of the child have been formed and such miscarriage is not caused in good faith for purpose of saving life of the woman, he/she causes isqat-i-janin. 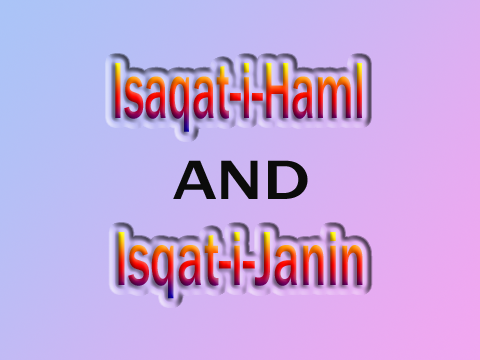 Isqat-i-janin can be caused not only by another person, but also by woman to herself. When a person causes isqat-i-janin and child is born dead, convict is liable to one-twentieth of diyat and is punished with imprisonment, which can extend to seven years. When a person causes isqat-i-janin and child is born alive but dies as a result of any act of offender, convict is liable to full diyat and is punished with imprisonment, which can extend to seven years. When a person causes isqat-i-janin and there are more than one child in womb of woman, convict liable to separate diyat or tazir for every such child. When isqat-i-haml results into causing hurt to woman or death of woman, convict is also liable to that punishment, which has been provided for such hurt or death. To conclude, it can be stated that causing of miscarriage is though basic point as far as both isqat-i-haml and isqat-i-janin are concerned, yet they have been described as separate offences and their different punishments have been provided under Pakistan Penal Code.